A great shoe for kids (and adults!) with “biomechanically challenged” feet. When I have Pediatric patients with “biomechanically challenged” feet and I have to convince them to stop wearing flip-flops, Converse or Vans – they are always crestfallen – until I mention Nike Shox. 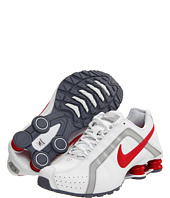 Kids love the Nike Shox because they are cool. 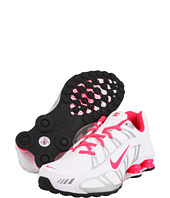 with problem feet – try the Nike Shox. What makes the Nike Shox a great shoe for patients with “biomechanically challenged” feet is its thick rigid sole, which allows for excellent protection of the rearfoot, midfoot and especially the forefoot area. If you have bunions or hammertoes – look for the Nike Shox with mesh toeboxes that allow for less pressure on any painful bunions. Another option is to take a leather shoe to a Shoe Repair shop and have them stretch the leather over the bunion area to decrease pressure on the bunion. 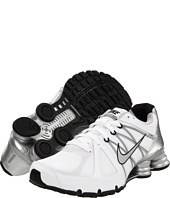 If you decide to try this shoe, make sure there there is no bend through the entire sole of the shoe – that is usually the case with the Nike Shox but there are so many different styles – double check before you purchase them. try this shoe with a brace that has a trilock system. If you can’t find the proper brace, follow up with any Podiatrist who will typically carry them in his or her office and the brace be billed to your insurance and should be covered as a durable medical equipment (depending on your insurance). is the best brace I have ever found. and you can only get it through medical facilities. If you don’t have insurance, I like the Futura brand, which you can find at your local pharmacy. Once again, no matter what I recommend, if you try it on and it doesn’t feel good – don’t get it! If no shoes feel good to you and if you are having chronic foot and ankle pain – go see your Podiatrist!